Modern house designs are increasingly employing more informal architectural layouts like open-plan kitchens and living areas. Unfortunately, such designs present a dilemma when it comes to heating. The kitchen is considered the beating heart of a modern home. It’s a venue for trying out new recipes and cooking delicious meals. An open plan layout completely redefines the role of a kitchen by providing space for not only cooking but also eating and entertaining guests. The living room space, dining room area seamlessly blend with the kitchen in an open plan layout. This warrants a unique heating solution that will keep your living space cozy. Gas heating options are a perfect solution. There is no gas heater that is better suited for an open plan kitchen and living area than a double-sided Lopi gas fireplace. Not only do you get to enjoy the logs and flames from either side but also it has uniform heat distribution that covers a wide living space. Most Lopi double sided gas fireplaces have a minimalistic design that blends seamlessly with any room. The installation is ideal for an open plan living area as it can act as a partition. The Lopi 864ST GS2 maintains an unparalleled tranquillity with its stunning design. This model is among the most popular in the Lopi line of double-sided fireplaces. It features a unique split-level Dancing-Fyre burner. The fireplace gives flames with glowing embers that are identical to a real wood fire. Its accent lights personalise each face of the fireplace adding aesthetics to a living space. Lopi inbuilt fireplaces are also a good alternative for making things cozy in an open plan kitchen and living area. The Lopi 564HO GS2 has a unique design that is coupled with excellent heat efficiency. It comes with a pyro-ceramic glass face that augments the radiant heat that ultimately warms the surfaces of your home. The heat capacity of the fireplace is around 158sqm and it comes with three different burner options. You can choose from either the Dancing-Fyre burner, the contemporary Diamond-Fyre burner or the high-performance Ember-Fyre. The Lopi 564Ho GS2 comes with a remote control, accent lights and a choice of either driftwood or stones for the burner. If you want a fireplace that will match up to your large open plan living space go for a Lopi linear gas fireplace. The Lopi 6015 HO GS2 is the largest in the Lopi linear range of gas fireplaces featuring 1.5 metres of flames and beauty. The heat distribution of the fireplace extends to around 260 sqm. The heat output can be turned down to under 50% to create a more subtle heat while maintaining an impressive flame. The fireplace comes with a large viewing glass, accent lights and six adjustable levels for fan, lights, and flame. This fireplace is certain to be the talking point of your home. Regency is a household name when it comes to gas fireplaces. They make top quality gas heaters with unique, eye-catching designs. The Regency GF900L inbuilt gas fireplace is one of the top-selling fireplaces in their line of inbuilt gas fireplace models. It features a stunning seamless design with beautiful wide-angle flames. The fireplace has electronic ignition and a remote control. It also features a wide landscape fire with driftwood log set. Optional features include premium glass fascia in black, clean edge finish option, optional framing kit and a contemporary door frame in black or brushed stainless steel. The Regency freestanding gas heaters and fireplace models are a simplistic option for heating an open plan living space. It combines the rustic design of traditional wood heaters with the efficiency of contemporary gas burners. The Regency FG39 features the finest and most realistic flame picture. It comes with a dress guard, black louvres and ceramic glass. The burner features three fans that enhance heat distribution and an option for manual or electronic ignition. The Regency FG33 is another spectacular classic gas log fireplace. It features steel design with black or brushed nickel accessories. It has 2 fans ideal for a small open plan living space. The fireplace has an authentic ceramic glass door allowing an uninterrupted view of the full, robust fire. No matter which fireplace you choose, you can never go wrong with a gas fireplace. It is economical, efficient and stylish. Big names like Regency and Lopi have an unmatched reputation for making the most stunning designs on the market. 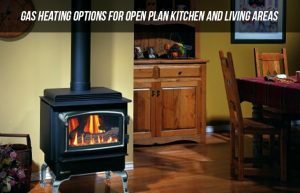 For open plan kitchen and living areas, gas heaters offer an aesthetic option for keeping the place warm. If you already have a daring design of an open living area, install a gas heater to match it up. You will certainly not regret it.